Don't miss the portrait issue! Translate your photos into art quilts with Joan Sowada, explore detailed thread painting with Jennifer Day, and discover how to make a simple portrait quilt top in a weekend with Jen Eskridge. Stitch monoprinted art dolls with Tracy Stilwell and make a fashion statement with Laurie Ceesay's hairstyle-inspired portrait quilts. Check out the next resist from the kitchen as Lisa Kerpoe shares her secrets for using corn syrup. 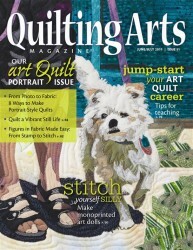 Mary Hettmansperger explores metal as a design accent and Jane Davila gives tips on growing your art-quilting career. Get inspired by a Q & A showcasing the stunning portrait work of Dutch quilter Colette Berends. Read all about the newest reader challenge and enjoy the latest adventures of Goddess Robbi Joy Eklow.